Cartoonist / activist Aseem Trivedi has founded an online magazine titled Black and White, which aims to serve as a launching pad for cartoon campaigns in support of “human rights defenders, bloggers, writers and journalists who are being targeted for their works.”.. 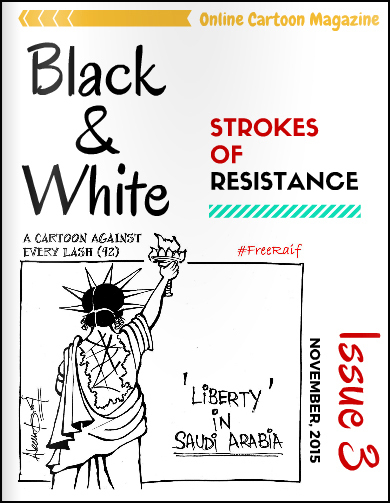 The third issue of the webzine includes an essay, Cartooning as Activism, by Trivedi, along with cartoons advocating the release from jail of Saudi blogger Raif BADAWI and Iranian artist Atena FARGHADANI, and a series protesting the arrest of Tamil folksinger Kovan. In 2011, Aseem Trivedi’s website Cartoons Against Corruption, which targeted Indian government misconduct, was banned by government agents in Mumbai. In 2012, Trivedi was jailed on charges of sedition for his cartoons. Trivedi was co-winner of CRNI’s Courage in Editorial Cartooning award in 2012 with Syrian cartoonist Ali FERZAT..
Those wanting to suggest themes or send cartoons to Black and White can contact the journal at mail.bandw@gmail.com.